While CCTV is more commonly found in shops and car parks, some homeowners opt to use these security systems for their properties. A CCTV camera can cost as little as £20 or several hundred pounds for more sophisticated devices. There are various types of CCTV security systems, including wired and wireless options. Regardless of which system is purchased, CCTV or closed-circuit television uses one or more video cameras and transmits signals to a specific location, such as a monitor or data storage device. When buying a CCTV system for a home, several pieces of equipment is needed. In addition to a camera, a CCTV system may require connectors as well as monitors and a digital video recorder or DVR for storing and viewing footage. Like any security system, CCTV works best with other measures such as reliable window and door locks, security lights and audible alarms. Wired CCTV systems are the most common type of CCTV security systems for the home. They are also the most affordable type of system. Wired CCTV uses cameras directly connected to a monitor or storage device by a wire. Although a cost effective security system, laying wire, cables and connectors for wired systems can be tricky in certain properties. Wireless CCTV systems feature technology that transmits images using an analogue or digital system. Since higher quality cameras are used, these types of systems are more expensive. Wireless CCTV only works with an operational internet connection and can experience interference from certain technology, including microwaves, routers and cordless phones. Metal objects and heavy masonry can also interfere with the system. Certain wired and wireless CCTV security systems may use a home's network or internet service to enhance accessibility of footage from a property. Service providers that offer IP CCTV systems give homeowners the ability to monitor their property by using a computer or a mobile device such as a mobile phone or tablet. Some CCTV systems also use electrical sockets and transmit images to a storage device rather than a monitor or DVR. These are known as powerline networked CCTV systems. CCTV security systems can be mounted outside a property as well as inside the home. The number of cameras and their location will depend on what level of protection a homeowner desires. Individual service providers can offer advice on where to place cameras to provide the greater level of security. When choosing outdoor cameras, ensure that the devices are weatherproof. Outdoor cameras should also be in a secure location but easily accessible for maintenance. If installing wireless CCTV systems, consider devices that encrypt signals to prevent anyone using a compatible receive from viewing footage from your home. CCTV security systems might include a range of additional features to enhance their effectiveness. Certain CCTV systems might offer remote access and motion detection, while others might also send email and text notification. Cameras might also feature night vision capability. Devices that are the most effective in low light are generally black and white or monochrome cameras, and some cameras might have the ability to switch from colour footage during the day to monochrome at night. Most CCTV systems store images using a hard drive or a DVR. When choosing a CCTV system, ensure that images are stored in a compatible format such as MPEG in order to view images in other systems. Most computer-based systems include software to view footage, although some DVR systems might not. Higher resolution cameras can take up a lot of space on storage devices, while cameras that are motion activated take up less space. Cost is a major consideration when installing a CCTV security system in a home. The more cameras in a system, the more expensive the security solution will be. Similarly, cameras with a higher degree of image resolution are also generally more expensive. Vandal-proof cameras are also more expensive than basic devices, although they offer greater protection for homeowners. Beyond budget, the type of system selected will depend on whether a homeowner would like to access their CCTV feed while travelling or away from the home. Similarly, a wired system can be more difficult to install and may affect the look of the property if wires have to be laid throughout the property. Image quality is also an important consideration. The better the image quality, the easier it will be to identify someone in recorded footage. Cameras that use smaller CMOS chips generally feature lower quality images, while cameras with larger CCD chips have better image resolution. Cameras with larger chips also have better results when filming with little light. When choosing a service provider, look for an experienced and established firm. Some companies are registered with trade associations, such as the Security Systems and Alarms Inspection Board and the British Security Industry Association. 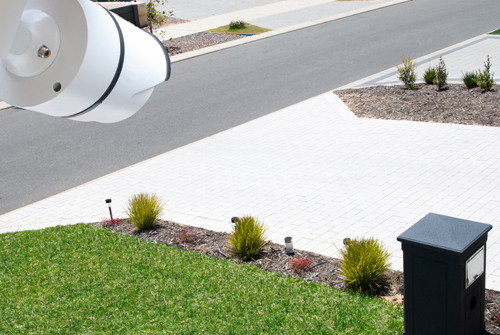 Homeowners should also speak to neighbours and address any privacy concerns before installing a CCTV system.